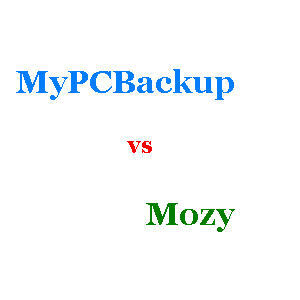 With price and features somewhat similar, and both starting with “M” 😀 we decided to compare MyPCBackup vs Mozy (home) and help you determine which of these online backup services might be better for you. Most people just want their file protected and only a small portion of us really care about some of the more esoteric features that really whittle away at our time here at OnlineBackupSpot creating and constanly updating our backup service reviews. Oh, and did we mention most of us want it cheap? Well, we’d rather use the term “inexpensive” since “cheap” implies poor quality, but cheap online backup might be what someone is searching for and, again, the customer is always right, right? As the sub heading implies, both MyPCBackup and Mozy both offer you a simple, easy, secure, automatic and affordable way to backup your files to the cloud; whether that be for safekeeping against hard drive failure or tragedy, or so you can share files and even access them from remote places. Each of these online backup services have features not found in the other that are worth mentioning. None is likely to be a game changer but when the services are so similar, who knows, one of these may be the deciding factor for you. MyPCBackup has been continuously making significant upgrades to their service and feature list ever since we started following them almost at their inception. Unfortunately, it is true that they make some things a little hard to find on their site, like PRICE! Once you get their lowest price on 75GB plan it costs only about 50 cents/month to upgrade from 75 to 250GB and then only about 70 cents/month more to get UNLIMITED cloud storage. MyPCBackup does support Linux but not to the extent they do Windows and Mac, and they mention right on their site that they prefer you use Windows or Mac; but this is not unexpected, Mozy doesn’t support Linux at all and few online backup services really do. Another unique offering that MyPCBackup has started showing on their website is the ability to give you and law enforcement a good idea of where your stolen mobile device might be located, based on IP address. Nice, Apple won’t do that for you even though they could. What you will get with any of the plans at MyPCBackup is unlimited file versioning which can come in real handy if you don’t realize you messed up page 7 of that spreadsheet LAST QUARTER and need it back. Mozy, by comparison, only saves 30 days of versions. A couple of features that distinguish Mozy home online backup from MyPCBackup are the 2GB permanent free account and the local backup option. Now the free account that was once highly regarded is now barely an also-ran since so many others have 5GB free, forever, like IDrive. The local backup option though is not only pretty cool for those who want a local USB hard drive backup in addition to the cloud protection, but it also runs concurrently unlike some of the others that require you to schedule local backup so it does not conflict with the scheduled cloud backup. So Which Do You Choose, MyPCBacup or Mozy? As with all product comparisons, the final cut is up to you. The “cheapest” online backup service of the two is probably MyPCBackup since they offer such a severe discount from the posted price; with Mozy they will give you a month free for a year of pre-pay and that’s it (or 3 months on a 2 year plan). Both do allow upgrades for more storage space and more devices, so the actual comparison on price will again depend on your particular circumstances. Whatever you do, don’t procrastinate! That seems to be when hard drive failures happen and you don’t want to get burned. Get a free trial going and see what works for you, START NOW! Stop back and let us know what you decided!